Sennheiser SC 638 part of the SC 600 Century range. 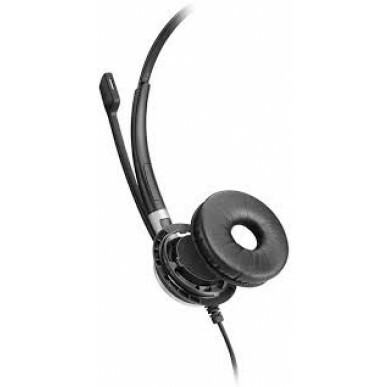 This version is a premium single-sided wired headset specifically made for narrowband desk phones. Designed for quality-conscious enterprises requiring outstanding sound performance, durability and exceptional wearing comfort. If you have a modern or VOIP phone check out the standard SC 630 model. For Panasonics and mobiles, the SC 632 is a better option. If you just not sure give us a call or opt for the standard SC 630 model. The Sennheiser SC638 Corded Headset aka 'The Century' is Sennheiser's premium ultra noise cancelling mono headset, designed to be used with your narrowband desk phone only. The SC638 headset has an over the head wearing style, with rotatable microphone for left or right hand side wear. Where to start!!??? Sennheiser have told us this is the ultimate, the bees knees, the dog's.... well you get the idea - they're pretty proud of it. But what to WE think of it? Pretty much the same actually. Sennheiser have an unrivaled reputation for all things audio and this headset is no different. 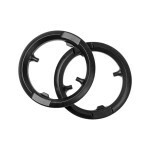 If you are buying a headset for someone who wants the best corded headset that money can buy and they have a narrowband phone - stop reading, you've found it, just add to cart now. The Century has HD voice clarity, an ULTRA noise cancelling microphone but is still lightweight and comfortable enough to wear all day. The ULTRA noise cancelling microphone means that even in the noisiest call centre, you'll sound like you have a corner office with a view. Most of our headset team wear ultra noise cancelling headsets (albeit wireless) so call and ask for a little over the phone demo of just how much noise it blocks out. The speakers are made from high quality neodymium so you can hear every utterance. These earcups fold flat for storage or travel. As you'd expect from Sennheiser, their patented Activeguard technology protects your hearing from sudden loud noises which can cause acoustic shock. This saves your business from hefty Work Cover claims. There’s really nothing bad to say about this headset headset per se – the only thing to consider is if your environment is noisy enough that you want an ultra noise cancelling microphone, you may wish to consider a binaural headset (on both ears) to help you concentrate. If you don’t have a headset port on your phone, a corded headset will take the place of your handset. If you still want to use the handset you can pick up a switch to allow you to swap between the two but really, at that price point you may as well look at the excellent wireless headsets from Sennheiser (the DW Pro range also have the ultra noise cancelling microphone). The Sennheiser SC 638 is for staff who want the best quality sound on the market and prefer a corded headset to use with their narrowband phone. If staff sit close together or noise levels are high, Sennheiser SC 668 may be a better option as it is binaural and helps staff to focus in a busy / noisy environment. There are also padded headbands available in the (also narrowband) CC 515 & CC 550. If you don’t need the ultra cancelling microphone or every bell & whistle, the SC 230 & SC 260 are both excellent headsets. Another factor to consider is the extra productivity that can be gained from the freedom to walk away from your desk while on a call. It is worth checking out the Jabra Pro 920 which is a great entry level wireless option for only a small amount extra. If you want to stick with Sennheiser then the DW Pro 1 Phone, is their magnificent wireless option, which also has an ultra noise cancelling microphone. If you think 2 ears are better than one, the DW Pro 2 Phone is your best choice. 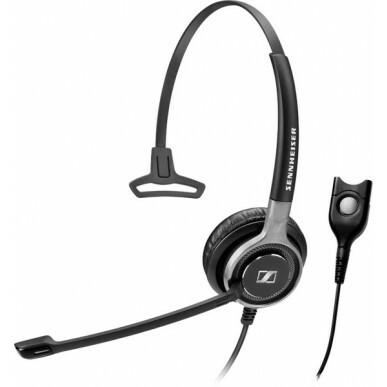 Sennheiser SC 638 is a premium singlesided wired headsetoptimised for narriowband phones. Designed for for quality-conscious contact center and office professionals requiring outstanding sound performance. Sound leadership With Sennheiser HD voice clarity and ultra-noise cancelling microphone, SC 638 optimizes speech intelligibility in noisy contact center and office environments. Quality design With a focus on quality materials and durability, SC 630 is built to withstand heavy contact center usage. Stainless steel and brushed aluminum parts with a unibody headband construction create an iconic, high-end design that enhances strength and robustness. User focus Sound enhancement features make conversations crisp and clear, and a leatherette ear-pad ensures powerful sound and wearing comfort. A metal reinforced headband maintains a perfect fit and is numbered for easy accurate adjustment. With Sennheiser ActiveGard® for acoustic shock protection, SC 638 is designed to enable quality-conscious professionals to perform at their best, in a narowband environment.